I totally agree with your comments about A Man of No Importance. Right show, right venue, right care in the making. Glad you got a chance to see it too. Your review brought tears to our eyes when your kind words were read to us by our lovely director, Janet Miller. You also made my day with your sweet comments- and everyone else’s too!!! I am so glad you enjoyed the show, and the audiences were always such an important part of the loving feeling that circles around us as we all work together on stage… It is such an intimate theater and everyone in the building- the entire audience- is really part of the heart of the story, in a very special way. It’s like we are all in Dublin living it moment by moment together. 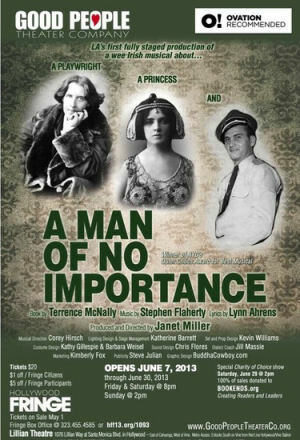 Thank you also to Musicals in LA for the nice comment preceeding this one! xo to you, too. Sincerely- Thank you for supporting this show and the entire company- We love you! Thanks for your thank you — it’s nice to know somebody reads these writeups. I’ve grown up with a love for live theatre, but can’t act worth beans (I’m an engineer by trade), so I’m a happy audience. I love to spread the word about good theatre, which is why I write up every show I attend. You and your company did a great job with this piece, and I’m looking forward to future work your company does (we also love to find good theatre companies — especially ones that do musicals and plays we don’t see that often). So keep up the good work, and hopefully we’ll see you in a future production, either with Good People or one of the other great theatres in Southern California (which has the best theatre around).